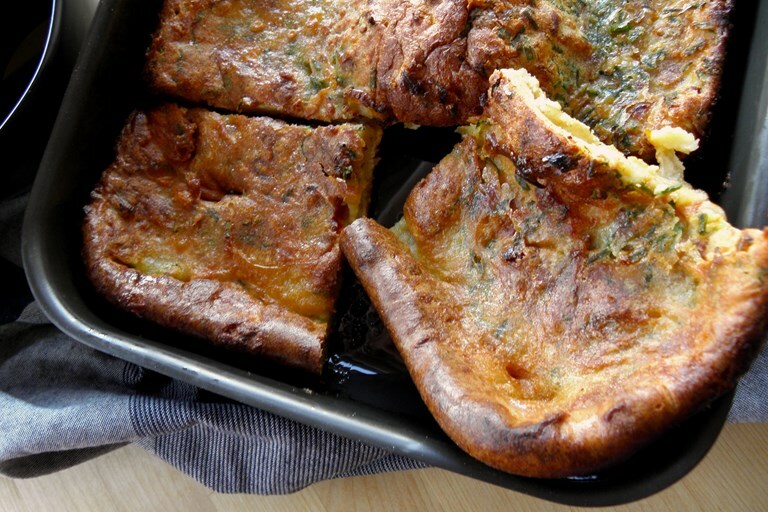 Howard takes inspiration from his childhood with this recipe for dairy-free and gluten-free Yorkshire puddings. Chives and sun-dried tomatoes really boost the flavour of the batter, but any combination of herbs would work beautifully in this recipe. When my sister and I were little, my mum used to ring the changes with a variation on the classic Yorkshire pudding, which she called season pudding (as in Yorkshire pudding with seasoning). Essentially this consisted of grating in a white onion and adding some dried mixed herbs to the batter. Tasty though it was, I remember it sometimes produced a slightly wet pudding as the moist raw onion seeped a little, rather than cooking through properly. (What a precocious child I must have been – never a fussy eater but a food critic from an early age!) This gluten-free and dairy-free version makes use of the wider choice of seasonings around nowadays, with fresh chives and finely chopped sundried tomatoes.